It’s interesting having the smudges of finger print around the image because there are many pieces of Dali art out there where people believe that other folks painted them and he just added his name … and raked in the coinage. This particular image is currently up for auction in a sale room in Alameda, California. 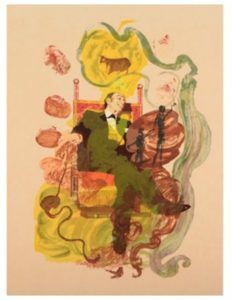 The expected price is between $400 – $600 – so not entirely out of one’s league if one fancies a Salvador Dali litho. Here are the full details, if you fancy putting in a bid!